Celebrating 15 years of a favorite Chick-fil-A customer tradition. 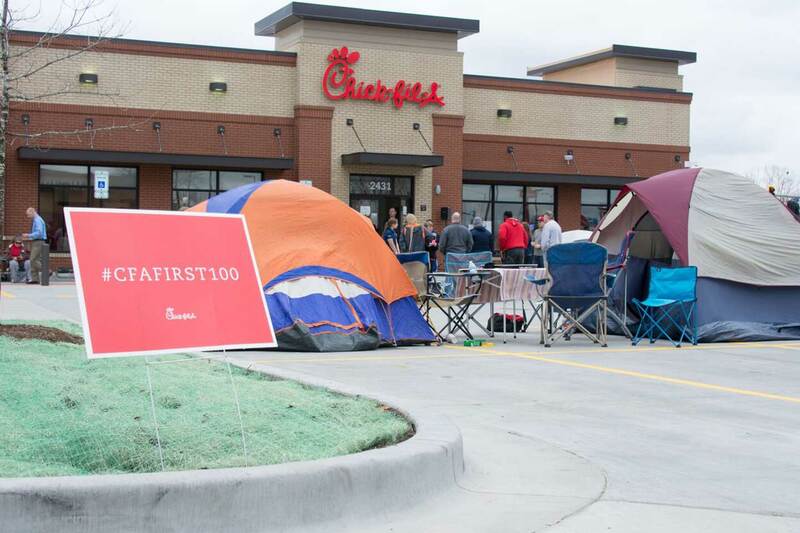 Today, the customer events have become a trademark of nearly 100 Chick-fil-A restaurant grand openings across the country each year—an overnight campout in the restaurant parking lot (complete with dancing, tents and games) that rewards the first 100 customers in attendance with free Chick-fil-A for a year, in the form of in the form of 52 coupons, each valid for one Chick-fil-A Chicken Sandwich meal. For Ploeser and his team, the idea started simple: give the first 100 customers who come to the opening free Chick-fil-A sandwiches for a year. As the team was busy preparing 1,000 boxed meals a day to take into the community to build brand awareness—squeezing lemons for gallons of lemonade, wrapping brownies and assembling boxes—they had no idea just how many customers would come and when. “It all changed when we saw people had camped out. We knew we couldn’t make it just a sandwich; it would have to be a full meal,” Ploeser said. Without a formal program, ice cream or many of the other First 100 touches that customers know today, the team rallied to produce “Free Meal” coupons on the fly, paired with a ribbon cutting with Chick-fil-A CEO Dan Cathy and the iconic Chick-fil-A Cow. Then-12-year-old Ramiro Solis and his aunt and uncle were the very first customers lined up after camping out in their RV overnight, equipped with lawn chairs, pillows and blankets—three items he considers essential for any “First 100” camper. 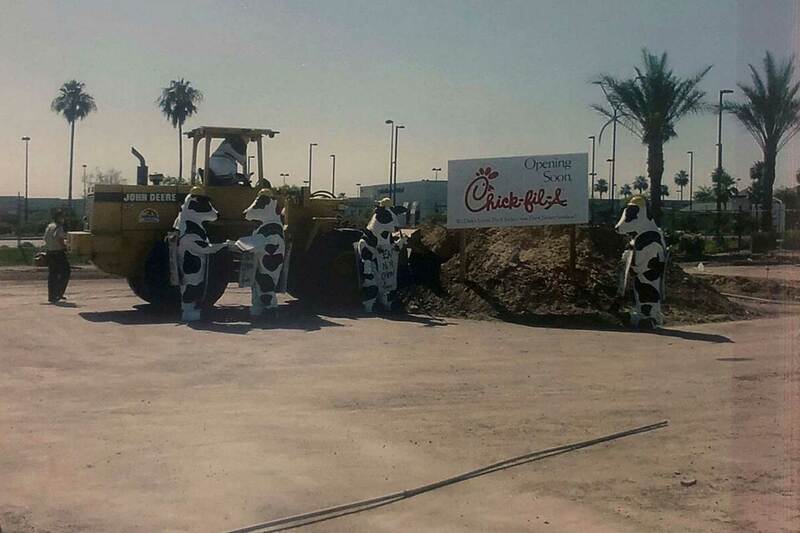 “We were ‘big fans’ of Chick-fil-A,” Solis recalls. For the next year, his family enjoyed their free meals every Tuesday during family night at the Goodyear location. The experience had an impact on Solis beyond the food. 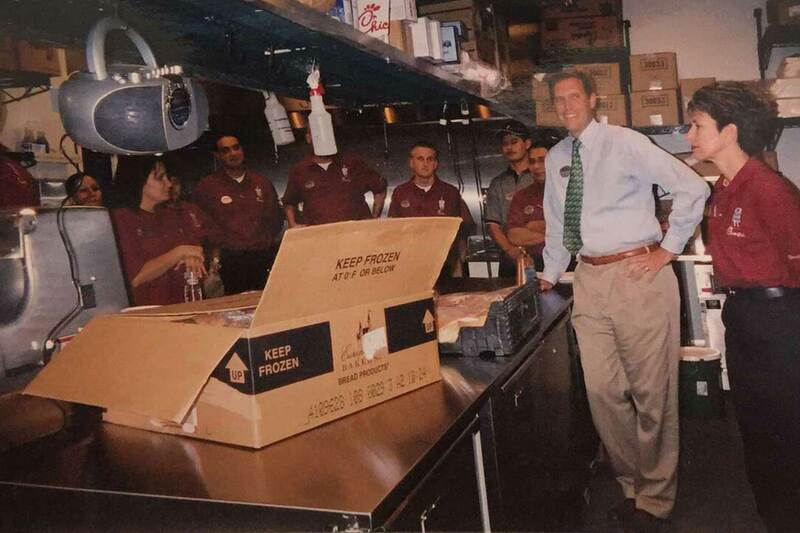 Several years after his First 100 Campout experience, Solis went on to work for Chick-fil-A in Goodyear for nearly 4 years. It’s here, he says, where he learned Chick-fil-A’s focus on “always putting the customer first” – a fitting nod to his forever title of “The First First 100” customer. Fifteen years later, Ploeser is still serving as Operator of the Goodyear location. Fin-tastic news, everyone: The Chick-fil-A Fish Sandwich is back at select restaurants across the United States! And as it was in the past, cod will be the catch of the day.